His grandson seemed to think it might be used when eating sushi. They look too narrow and deep to be used with sushi. The bowls are too small IMO to hold rice and the person who had these was Italian LOL. His grandson seemed to think it might be used when eating sushi. Japanese rice bowls are pretty small compared to bowls that people in the west would use for rice. They are meant to be held close to the face when using chopsticks to make it easier to push the rice into the mouth. . I agree with OP that they appear too small for rice. I'm wondering if they're tealight candle holders. But that wouldn't explain the smaller items in the first pic. Possibly a sample set for a company salesman to use as examples of the workmanship? The white bowls are definitely not rice bowls. They are the type more likely used for side dishes (tsukemono, bean sprouts, edamame, etc). The top picture is of chopstick rests. You can see one similar on the top shelf in the picture of numerous chopstick rests. I don't think so. The green chopsticks rests (hashioki) will lie on their side and the chopsticks will rest in the small indentation. The white part is the bottom of the chopstick rest. I think the design is of a green gourd that will lie on its side. I have seen ones similar to this at upscale eating places in China. Ok, I will go with chop stick rests and small rice bowls. I do want to sell them. I have no need or room for them. The hot version is just simmer the tofu in hot water until it is hot and then put the same cold stuff on it. I like the hot version better. The heat carries through the other ingredients and gives it a kick. I've never seen a rice bowl like that in Japan. 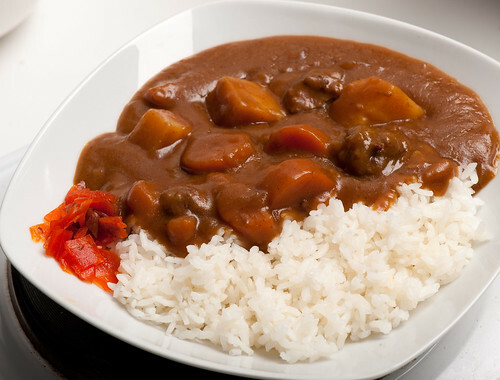 I've seen the regular ones, and there's the curry rice dishes. https://www.google.com/search?q=rice...ih=666&dpr=0.9 typical rice bowl. No, they don't shovel it into their mouths, as far as I've seen. That is like... barbaric. The other bowl is an oblong bowl. Most of the time. Or a regular plate.